Sen. Hillary Clinton would not have won primaries in the nation’s two largest states—California and Texas—if Latinos had not turned out in such large numbers and if they had not voted so heavily in her favor, according to an analysis of exit polling data. She also would not have carried a third state—New Mexico—without strong Latino support. In all three states, Latinos accounted for at least 30% of the total votes cast in the Democratic primary, and Clinton outpolled Sen. Barack Obama among Latinos by a ratio of about two-to-one. In Tuesday’s primary in Texas, Clinton’s winning margin of votes among Latinos was nearly three times as great as her overall statewide lead in votes. 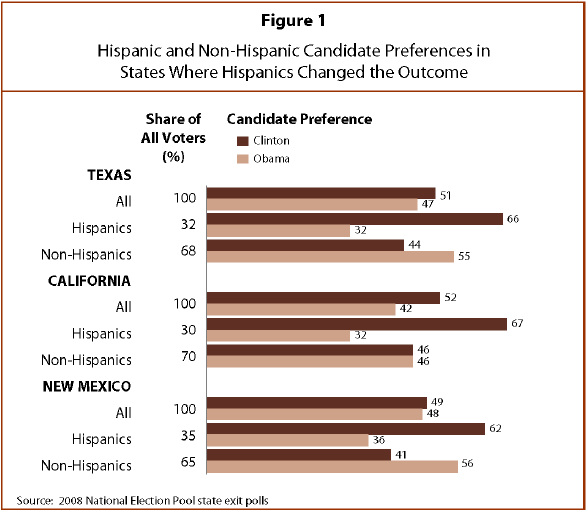 Calculations based on exit poll data show that Obama carried Texas by 55% to 44% among all non-Latino voters. However, Latinos accounted for 32% of votes cast in the Texas primary, up from 24% in 2004. They favored Clinton over Obama by 66% to 32%. In the Feb. 5 primary in California, Clinton’s winning margin of votes among Latinos was slightly larger than her statewide tally over Obama. Based on calculations made using exit poll data, the vote for Clinton and Obama among all non-Latino voters was a statistical dead heat of 46% to 46%. However, Hispanics made up 30% of the Democratic primary electorate in California, up from 16% in the 2004 Democratic primary. They favored Clinton over Obama by 67% to 32%. In a tight race, Clinton won New Mexico by only one percentage point. Among Hispanics, however, her winning margin of votes was nine times as great as her overall statewide vote lead. Non-Hispanics voted for Obama 56% to 41%. In contrast, Hispanics favored Clinton 62% to 36%, and they were 35% of all voters. In several other states, the Hispanic contribution to Clinton victories was not as pivotal as it was in Texas, California and New Mexico, but it was significant nonetheless. Latinos accounted for 20% or more of Clinton’s winning margin in three of the four other states for which the Hispanic vote can be reliably estimated based on exit poll results—Arizona, Florida and New Jersey. Clinton may have won all of these states even if Latinos had not turned out in such large numbers and had not favored her by such lopsided margins. But her margin of victory would have been smaller, as would the number of delegates she garnered. In Illinois, the only state with a large Hispanic electorate that Clinton has not won, Hispanics gave their support narrowly to their home-state senator. Obama carried the Hispanic vote in Illinois by one percentage point, compared with his overall victory margin of 32 percentage points. 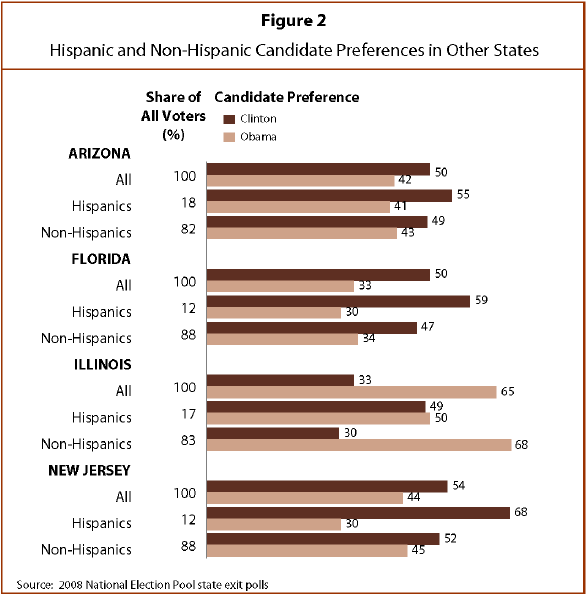 As the rest of the primary season unfolds, Hispanics will play a lesser role because they do not constitute a major share of the eligible voters in any of the remaining states. However, on June 1 voters in Puerto Rico will choose their 55 pledged delegates and Latinos will comprise virtually the entire electorate in that contest. Also, if there is a revote in Florida and Michigan—as some Democratic Party leaders are now urging—Hispanics are poised to play a significant role in Florida, where they accounted for 12% of the turnout in a January 29 primary that produced no delegates because of an intra-party dispute over the timing of the contest. In that January vote, Latinos in Florida favored Clinton over Obama by 59% to 30%.